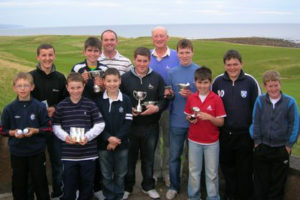 Brora Golf Club – Juniors. Join us if you are under 17. At Brora Juniors we encourage every youngster to join us in playing a game which provides fresh air and exercise in one of the most beautiful locations possible along with friendship, discipline and a competitive spirit. And all for £10 per year. 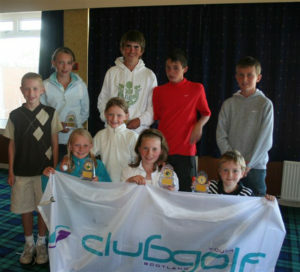 In fact, we actively recruit primary school pupils from the local schools through the Club golf scheme and they are all provided with beginners coaching every Friday afternoon during the May to September season, and then they are encouraged to join the club and to play in our weekly junior competitions which are graded to suit all abilities, experiences and all ages. Our junior golf club has over 90 members of which around half are local children and the rest are regular summer holidaymakers who have discovered the informality and friendship of Brora and the superb golf course that we play on. We encourage and welcome boys and girls to join us and are encouraged by the growing number of girls taking up the game. For such a small and remote club we are fortunate to have Malcolm Murray as our professional – as he is enthusiastic about junior golf development and actively encourages and coaches our junior golfers including winter indoor classes on Monday evenings as we strive to bring out the best in our young members. Brora is supported by 5 of our adult members who have taken their PGA/Clubgolf coaching certificates so that they too can help bring out the skills of our young members—and success in that respect can be demonstrated. 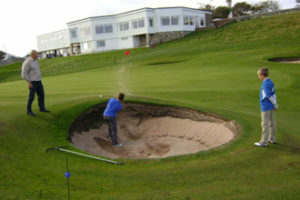 The club hosts a Junior Open every Summer. The junior section plays regular matches against the Ladies, the Senior Golfers sections and against the men’s golf club section to sharpen their competitive skills and to help them learn from their adult opponents—mind you the kids usually win! Our juniors play regular competitive golf from may to September in medals, Stablefords, Foursomes and in match play Club Championships and eclectic trophies. They are encouraged to strive for adult handicaps and are welcome to play in the adult events within the club – and are often very successful. The club is in good heart and looks forward to the future as it encourages the youngsters to come through and bring credit to the club and themselves while enjoying friendship and the fun of playing a great game in a wonderful place. If you are aged between 8 and 17 why not join us?